Do life or be done by life. There is no in-between. We can either do life or be done by life. There is no in-between place where life is not happening. As so often happens, the words emerged as I was rising out of my meditation this morning. And then I forgot them. I scrunched up my eyes, scrunched up my face into a grim expression and fought to remember the words that had hit me like a potent cocktail just moments before. Relax. Breathe, the voice of wisdom from within me whispered. There is no in-between place. Where are you in your life today? Are you standing in your power? Standing in your voice, speaking out in loving kindness for what is true for you? Or, are you letting life have its way with you? Letting life dictate the ebbs and flows, rhythm and tempo of your journey? Stuffing down the words you yearn to speak, the actions you ache to make? It’s often been said, ‘life is not a dress-rehearsal’. It’s the real deal. The real thing. And we only have one crack at gettin’ ‘er done. Get on with life today. Breathe deeply and tell yourself, this is not a dress rehearsal. This is my life where I stand tall, speak up and let out all the wonder and magnificence that lives within me, just waiting for me to wake up and set it free. It’s easy to feel defeated. It’s easy to feel like life is a daily struggle to get by, moment to moment, without any thought for the quality of each moment passing by. Being passive in life is easy. It’s what you’ve done for so long. It’s how you’ve felt for the forever past you can remember. Being passive in life doesn’t get you anything other than more misery, more feeling defeated, more feeling like you’re not worth the bother. Hold on to the belief that if you don’t turn up and speak your truth and live your life as if it’s the only life you’ve got, no one else will. No one else can. Sure, there are rocks on the road, hills to climb, obstacles to overcome. There are sunrises to witness. Sunsets to breathe into. There are rivers to swim and seas to cross. There are mountains to summit and ocean deeps to dive into. There are pools of love to fall into. There are arms to embrace and smiles to share. There are moments to experience the wonder and awe and pure joy of being alive, being here, being you! Don’t let life do you. You do it! Go on. You know you want to. Go ahead. Do life! Categories: Essential Journey | Tags: a purpose-driven life, essential journey, letting go, living intentionally, living with intention | Permalink. This is how I try to live my life. We talk all the time about how we wouldn’t change our traveling life. It’s not always easy, but we are living life, instead of just drifting along. And in the process, Mary, you inspire others to live and not drift. Yes, Louise i agree with you! Let life flow…get it go…soar with it! who knows how much is left. Make the best of every moment and the rocks give way when we keep moving, they crumble if we flow persistently. All we need is the will-power and the determination. Thanks for lovely thoughts. Your friend’s words are an important reminder of the precious nature of every moment Mark. I am sorry for his pain. It was a fantastic summer day — and today promises to be equally as fantastic! Another great post with such a positive message. Thanks! 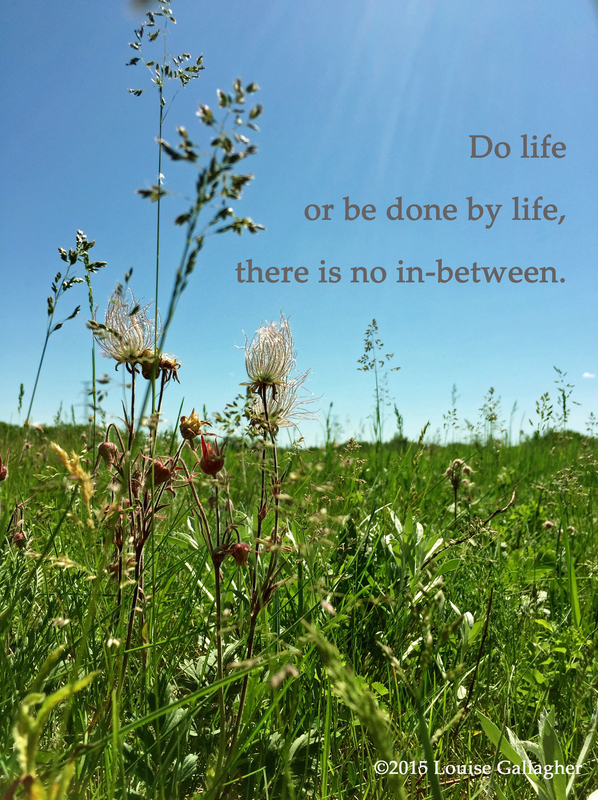 “We can either do life or be done by life.” Life an intentional life and avoid being done by life! Very true words. Life is a very active adventure and being passive will only cause us to miss out. Thank you Astrid for dropping by — and yes, we dare not be passive in life! It will pass us by.